My friend and I threw a shower for another dear friend over the weekend. When thinking of a theme I couldn't get owls out of my head. The invitation: The baby had already come so I said "Look whooo's here" instead of "Look whooo's having a baby." I found this remnant at Joann's for $2. It was the perfect colors and reminded me of owl eyes. I had to make a table runner out of it. I couldn't resist making this fun owl as a gift. I got the pattern for free from Toad's Treasures, HERE. It was so fun and easy to make, I'm dying to make a million more. Seriously people, this was a half hour project with scraps I had on hand. It was a fun party with great friends, I'm very blessed to be surrounded by such amazing people. so adorable...love the chocolate owls, and the owl bunting, and the owl pillow..oh geeze..i love it all! popping by from the girl creative! so cute! I absolutely LOVE owls!! My son has requested a ladybug theme for his 3rd birthday (in NOvemeber) so I will have to think of some ways to get creative!! This is just ADORABLE!!! I threw a "bee" themed shower this weekend since my SIL didn't find out what she's having...hence "What's it going to bee.." LOL. I absolutely love the owl idea! So so so cute! P.S. The cookies are so amazing! Hi Kalleene, I'm so excited to see you at Craft Schooling Sunday! 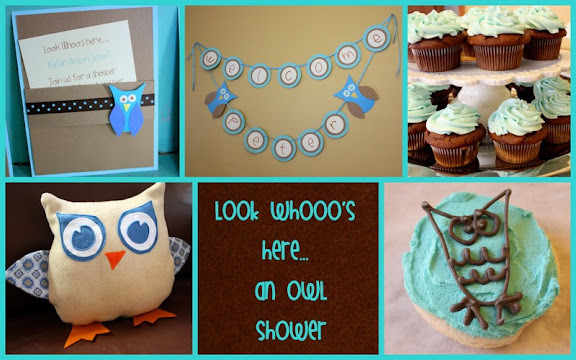 The owl shower is just the cutest, thanks so much for sharing! hope you'll be back again soon, and all the best! What an adorable shower. You throw such great little parties. I hope i get the hang of a sewing machine so i can make an owl one day! Thanks so much for the comment so I could see your super cute owl!! Loved the party...I wish I could eat one of those cupcakes right now! awww... love it! we threw an owl shower this summer, too. I wish I would've made an adorable owl plushie like you did- too cute! What a sweet shower.... love the owl theme. I'm gonna go check out the plush owl tutorial....that came out so darned cute!! Love it! I adore owls! I am having a coffee party this weekend and may have to try out those cupcakes! I'm visiting from Just Something I Whipped Up. Have a great week! Kalleen! You are adorable. You really have a knack...for everything! :) I love the Owl chocolate details on the cookies. Wow! I LOVE your version of the OWL!!! I too made an owl off of the pattern from Toad's Treasures! soo adorable! love the cupcakes and the banner! Oh I just love owls! What great colors too....such time and detail went into this shower! Thanks so much for stopping by and linking this up! Have a fabulous day! You had me at owl...and I love the green and brown color scheme! So simple but elegant. The mint chocolate cupcakes sound so yummy! Stopping by from CSI project! very cute! i love the owl cookies. this is amazing! i'd love for you to link up to a crafty soiree tomorrow at www.yesterdayontuesday.com! What a darling shower! I love the color scheme, and all the owly details! Found you through CSI Project! Super cute shower! I love the owl theme and your stuffed owl is adorable! Thanks for the inspiration! Love, love, love the color scheme! The owl cookies are adorable. Such a cute theme. here from the Hodpodge party...gotta say this was an adorable themed party! I loved the runner and the cupcakes look so yummy! So cute!! Thanks for the link to the owl pillows! I have already made two and I know I will make more. They are so easy and turned out super cute! Half an hour you say? That is a ridiculously short amount of time for such a sweet snuggle friend! I love all the cute touches you put into the shower. I also had a few "meet the baby" showers so I really like your clever twist on the wording. Looks like a fun time! Thank you for joining us at A Crafty Soiree! I hope you'll come back next week and link up again! I'm making the owl stuffed pillow. I printed the pattern but it does not have the first layer of blue for the eyes and it makes SUCH a difference. Do you have that somewhere or did you just eyeball it? Thanks. Looking forward to the finished project.